Cecil Billy Gideon, son of Raymond and Iva Rose Molt Gideon, was born, October 16, 1949 in Waynesville, Missouri. He departed this life, Tuesday, September 25, 2018, in Stoutland, Missouri at the age of sixty-eight years, eleven months and nine days. He is survived by his children, Brian Gideon and wife Elizabeth of Stover, Missouri, Janna Gideon of Versailles, Missouri and Cody Gideon and Laci Scott of Florence, Missouri; his grandchildren, Seth Gideon, Jaxson Gideon, Ava, Gideon, Levi Halvorsen and Tyler Halvorsen; his siblings, Ralph Gideon of Montreal, Missouri, Pauline Hodges and husband William of Lebanon, Missouri, Patsy Brown and husband Billy of Stoutland, Missouri and Stella Stamper of Montreal, Missouri and a host of nieces, nephews, other relatives and many friends. Billy (as everyone knew him by) was raised in Linn Creek and had attended grade school there. He joined the United States Army during the Vietnam War and received a honorable discharge. He had worked various jobs throughout his life. In his spare time, Billy loved to work on lawn mowers and motorcycles. He spent most of his time outside watching the birds and looking for arrowheads. He was a very creative and independent man. Billy had made many different things. He loved watching westerns and Survivor. 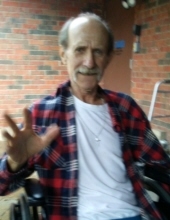 Billy had accepted Christ as his Savior and attended church while in physical rehab at Richland Care Center. He was a loving dad, grandpa, son, brother, uncle and a caring neighbor and friend. We celebrate his life and his accomplishments and will treasure the memories he created for his family and friends. Graveside services with military honors will be held at 11:00 a.m., Friday, October 12, 2018 at Freedom Cemetery, Montreal, Missouri. A fund has been established to assist the family and donation maybe left at the funeral home. Arrangements are under the direction of Allee-Holman-Howe Funeral Home of Camdenton. To send flowers or a remembrance gift to the family of Cecil Billy Gideon, please visit our Tribute Store. "Email Address" would like to share the life celebration of Cecil Billy Gideon. Click on the "link" to go to share a favorite memory or leave a condolence message for the family.